With the Christmas season and the New Year comes a whole host of new house hunters. 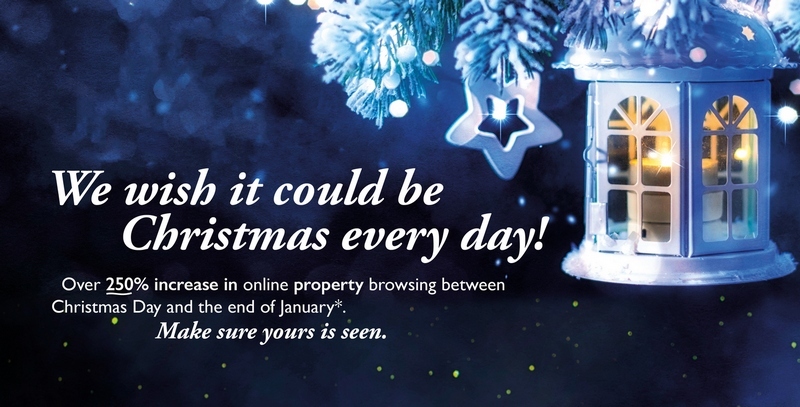 In fact, we see a significant increase in the number of people browsing for property online between Christmas and the end of January with many people using the festive season to take some ‘big’ decisions – to move jobs, to relocate, to move in or out with partners or to expand the family. Rightmove reported a 250% increase in traffic to their site during this period and other property website including Country Properties, see similar trends. We know that buyer or tenant’s timing during this time of the year is usually more likely to be determined by circumstances rather than the season. Serious buyers or tenants won’t let the cold deter them. So, if you’re thinking of putting your property up for sale or let, there is no time to delay, make sure you are seen by this new, motivated audience of house hunters. Despite what some may think, the wintery photographs can, when done right, help show off your home at its best. Cosy rooms and twinkling lights can make for stunning interior photographs and can really make your home feel warm, homely and atmospheric. So, if you’re thinking of selling or letting now or in 2019, contact your local Country Properties to find out how we can get your property on the market quickly and efficiently, so you can benefit from the increased audience.